Sturdy construction. Almost no scratches on the plastic part of the shell, no scraps on the paint. The only problem has been with the directional pad that become a bit flaky and lost the small gummy thingy on top of it. No pun intended. All the features are usable. The camera takes photos that are not that bad if light conditions are OK. The audio quality is decent. The light mode. Very practical when you have lost your keys in the long and dark Norwegian nights. The operating system has been programmed by handicapped blind monkeys. Seriously, the device is powerful enough to display a real time fractal zoomer, but crawls to a halt when you get nearly 200 SMS in the inbox. Which is why the system tells you happily that the message memory is 95% full. I guess it also explain why one need to regularly power cycle the telephone to avoid it to leak memory and crash (and when this happen most of the time you have to reformat the Memory Stick because it become impossible to access). Memory Sticks. I hate proprietary formats. The non standard multi-purpose/headset connector. Managing to not make knots in the wire requires heroic talents. Obviously I'm not a hero, should look at me trying to unknot the cable in the metro in the morning. The camera is very slow to take a picture. A gazillion of small annoying defects in the user interface all over the place. If you want an example of this latest point, let just point out the retardness of the T9 handling. First obviously every single people's name is part of the T9 dictionary. Else it would not be active when you add contacts names. Well of course no, people's name are not in it, so you disable T9. Then you enter then name. Unfortunately the enable/disable flag is global to the phone, so you have to re-enable it when you want to send a SMS. It is really something minor, but why oh why not testing this kind of thing ? And why can I change the wallpaper, themes, colors, ring-tones, ... but I cannot select which dictionaries I want to use ? Is it too complicated to not want the Finnish dictionary, but to want English, Norwegian AND French ? That's basic usability 101. 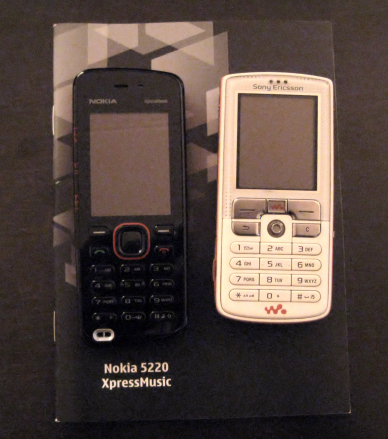 So yeah, this mobile was my basis on which to compare other mobiles. After doing a quick analysis of what my collegues used, I had to reach the quick conclusion that Apple's been doing their job well: The number of iPhones is insane. Personally I'm unimpressed by the iPhone: It is large, it is heavy, it is expensive, finger prints sticks all over the place, ... nice design, but not for me. Then I got a phone call from my phone operator, offering a special subscription (better than the one I had) with a mobile for 1 kroner. Sounded like the perfect occasion to test some other brand of mobile, at worse if the phone sucked I could still use the w800 :) This is how I got the new Nokia 5220 ExpressMusic. On the paper it looked nice; after reception the mobile itself looks nice, it is slim, quite light weight, nice shape, nice colors, standard mini-jack for the headset, microSD card for the music, small usb cable. So far so good. The camera is even slower than the w800 one, that's quite an achievement. The Nokia PC Suite is not very stable, not very well designed either. It kind of works, but you better don't lose connectivity while working else you have to restart everything. And importing the contact has been a multiple hours fight: Between the unability to import a .VCF file containing more than one contact, and the peculiar .CSV format it supported... had to use my zen jedi powers. The battery life is not particularly impressive. The headset quality is sub-standard (lot worse than the Sony ones), but fortunately I had some Koss ones lying around.